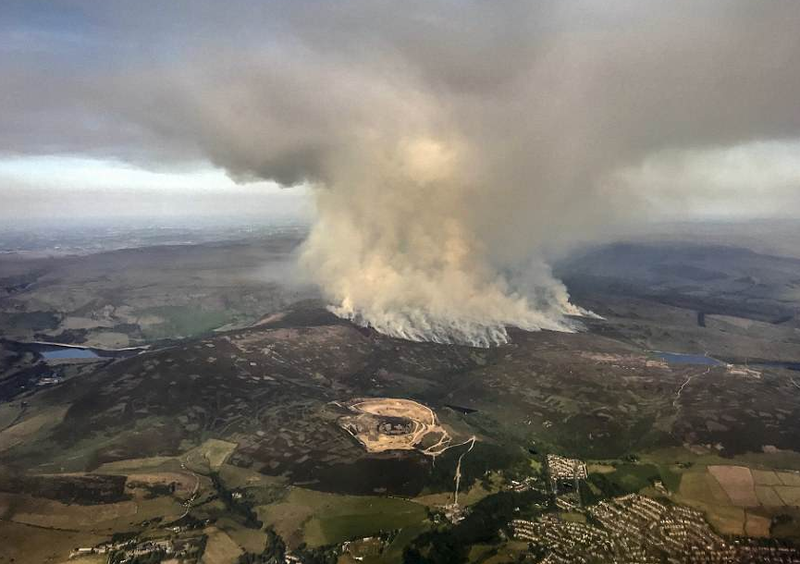 The heatwave that the UK is experiencing this week has caused a major forest fire, which was almost defeated over the weekend, to spread into a major emergency which is now burning uncontrollably near its second largest city, Manchester. Several people in rural villages have been evacuated as multiple firefighting squads from nearby towns have been called in to battle the blaze. The Mayor of the Greater Manchester area, Mr Andy Burnham declared that at this point a "request to the military for extra support" was being drafted in case they needed “a back-up plan" to support firefighters. "It's not clear yet whether that will be needed, but the request is going to go in. I think everybody feels a great deal of gratitude towards them [firefighters] but it's hit the point where reinforcements are needed and that's what we're arranging." Evacuated residents said that the fires spread very quickly as the ash was falling like rain. 43- year-old Mr Pete Woodward stated: "It looked like the apocalypse. There was a towering inferno of flames. The flames were 500 metres long, it was a raging wildfire. You could hear the odd explosion but thankfully the house survived." Local police declared on Wednesday that Manchester homes in Carr Rise, Carr Lane and Calico Crescent would all need to be evacuated as the flames crept ever closer. Tameside Borough Council leader, Ms Brenda Warrington explained that in her village some " 50 homes have been evacuated with about 150 people involved". The member of parliament for the area of Stalybridge and Hyde, Mr Jonathan Reynolds admitted: "We haven't had anything of this scale in living memory, never had to evacuate people or close schools." The UK weather forecast isn’t much help as it is supposed to stay sunny for the next five days.